There have been a lot of incarnations of Scooby Doo through the years. There’s been Scooby Doo, Where Are You? ; Scooby’s Laff-Olympics; The 13 Ghosts of Scooby Doo; A Pup Named Scooby Doo; and on and on. Since the crime-solving, possibly pot smoking great dane has been such an institution through the years, we’ve gotten to meet several of the Doo family members. We’ve met everyone from Yankee Doodle Doo to his annoying nephew, Scrappy. To keep everything straight, I’ve put it all together for everyone in a nice, neat, orderly family tree. Click on the image to get the full resolution. 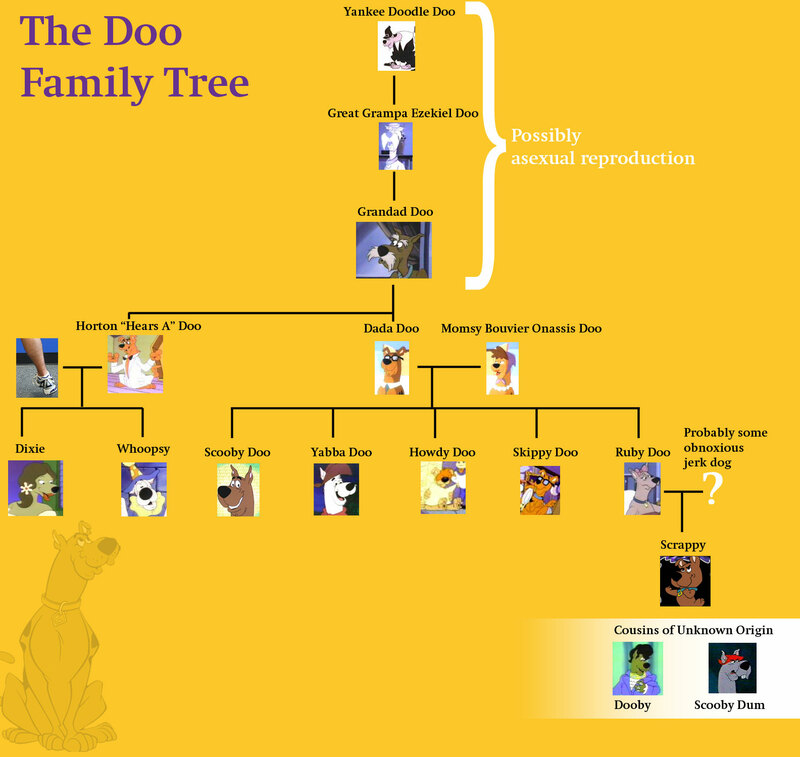 Big thanks to Wikipedia for helping me sort all of this out for future generations of Doo dogs. When I was a kid, that show was my world. Until I was 5, Daphne was the ideal woman. Scooby Doooooooooooooooooo is where it’s at! scrappy is to cool to be annoying your crazy and stupid if you think that besides you are missing scooby dee. Wait a second!!! You missed Scooby Dee!! His cousin with a southern accent, Scooby Dum is her father. ive been looking for somthing like this everywhere thanks its great and ur great just one mistake. you are missing scooby dee, scooby doos cousin. Why is Horton paired with a leg? I know the show had some minorly suggestive things, but seriously? A leg?